Now disgraced, Richard Davisson was once celebrated in newspapers and dime novels for his daring exploits apprehending mail train robbers. Then, he was falsely accused of collusion with the robber he couldn’t apprehend. Now he’s trying to start over with a new name, an office job and marriage to the boss’ daughter. However, there’s a small matter of his lover – and her mistress. When his lover turns up dead – burned to death by ‘means unknown’, Richard is the first suspect. But when a train wreck throws him at the feet of airship inventor Kate Jordan – one that is harnessing the aether itself to make her ship fly – will he stick with his original plan for a quiet life? Or help thwart a scheme to steal Kate’s airship, when the schemer is the one man he couldn’t bring to justice–his own father? Cults, steampunk, magic, immortality – Kate and Richard lead a merry chase into the Aether, finding the real meaning of their lives along the way. 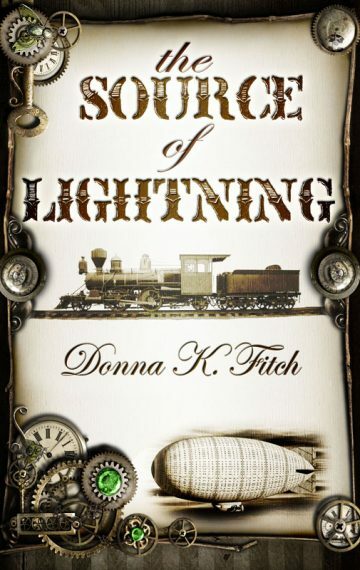 A sizzling, breathless steampunk read from start to finish, The Source of Lightning is a “must read” for any science fiction, magic realism fan.